In Dead Island, the first-person hack and slash RPG, you went around a tropical island, punching, kicking, maiming and shooting zombies. In Dead Island: Riptide, you do the exact same thing. For some, this is enough—but not quite for others. Bashing zombie heads in is fun. Collecting all kinds of loot is also fun. But glaring bugs, tedious combat, and an awful feeling of déjà vu blight what should be an enjoyable zombie-killing romp through the jungle. Let's have a look at what reviewers are saying. It starts promisingly enough: a mad dash off a sinking ship, a military coup, and a zombie horde just aching to be shown the business end of a shotgun. And then, just like that, the promise is taken away. Dead Island: Riptide teases far more in its opening minutes than it ever manages to deliver across its lengthy campaign. There's no drama, and little excitement. Instead, there's a rehash of old ideas, combat that's fun for all of five minutes, and a seemingly never-ending slog of repetitive missions filled with characters that have the emotional depth of a wet sponge. If there were ever a video game equivalent of smacking your head against a brick wall, Riptide would be it. It’s been described as a spin-off of the first game, which is a good call on the part of Techland and Deep Silver because if they called it a sequel they’d have been taking the piss. Riptide is basically the first game in a different location: as before, the survivors of a zombie apocalypse band together to explore their environment, looting and shooting their way to a potential escape. The same four survivors are back, joined by a new Australian guy who specialises in hand-to-hand combat and snarling machismo. Listen. I'm an American. I hate zombies too. But killing Riptide's zombies isn't fun. Lopping off a head or the occasional arm? Great. But there's no depth. No strategy. No blocking even. Run up to a zombie and hack it to death. Got a stronger zombie? Run around it and keep hacking. As you develop weapons that let you paralyze zombies, even this much strategy isn't necessary. Different enemy types complicate the battles—exploding Suiciders, acid-spitting Floaters, bulldozing Rams—and your surroundings come into play. Sometimes you're clambering onto caravans so you can rain down Molotovs; other times you lure zombies into shacks and mine the doorways so they blow up when they follow you out again. Your weapons are glued and taped together - and don't fall to pieces as fast as they did in Dead Island—while you're constantly scavenging for more parts, and you frequently run out of stamina or room to manoeuvre, which sends you diving into the inventory for inspiration to improvise. Guns are available but you often end up favouring blades and cudgels. Played alone, it's an authentically scrappy way of fighting for survival. One failure that can't be ignored is that the world still doesn’t look that hot. Textures pop in, screen tearing persists, and missing frames aren’t uncommon. Performance is worst on the PS3 and best on the PC, but no version is unplayable or perfect. But what’s so crazy is that once again, this stuff really doesn’t matter. Your quest log brims with story missions, you run into side quests wandering the sun-splashed island locales, and Techland tosses in new team missions that make the survivors at your bases more helpful in battle. Just like the original Dead Island (that's a phrase I'm saying a lot today), RPG gameplay saves Riptide from its narrative mistakes and lackluster graphics. Despite the additions, Riptide suffers from the same bugs and blemishes as the first game—and then some. Enemy behavior is erratic, but not in a purposefully scary way. Zombies spend minutes tearing at a barricade, only to wander away the moment it falls. Foes phase through obstacles, glide up walls, and land hits from improbable distances. The mini-map is geographically barren, and objective pathways flicker on and off, requiring you to frequently pull up the full map. Even worse, your treasured and customized weapons can inexplicably disappear from your inventory—a rare but frustrating problem. 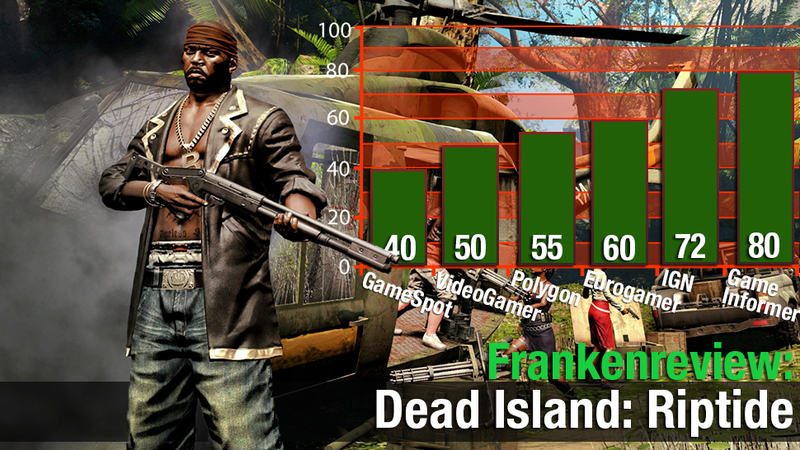 I enjoyed the first Dead Island game for what it was, despite its many flaws. I’d suggest playing the game if you were looking for a something to play with a group of friends, which also involves some pretty neat melee weapons you can craft on your own. I never expected Riptide to be a sequel, exactly. It always looked more like an expansion, and I always hoped it’d be a more polished version of the original. Somehow, things went in reverse. Riptide feels like it could have been the first in the series, simply because it is an absolute mess of a game. Top image courtesy of Tina Amini.